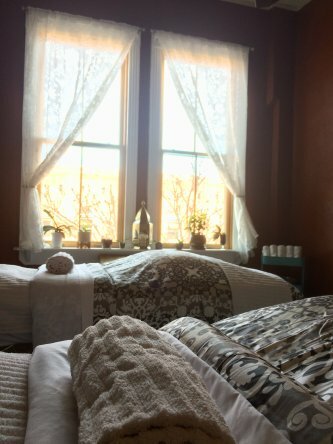 An Intimate Day Spa located in Downtown Durango offering customized, organic treatments to bring you the ultimate relaxation experience. A relaxing full-body massage using light to medium pressure. Integrating medium to deep pressures as needed to areas of tension. Firm pressure focused on releasing tension in the deepest layers of muscle tissue. Melt away tension with our healing hot basalt stones incorporating our Integrative Massage techniques. A nourishing, herbal escape using local, organic products for optimal skin renewal. A skin treatment designed just for him with hot steam towels to deeply cleanse pores while reducing irritation and inflammation. A deep pore cleansing facial to eliminate excess oil and gently calm irritated skin. Turn back time with this exfoliating and hydrating facial designed to reduce fine lines and reveal that vibrant, healthy glow! Reverse signs of aging and sun damage with our deeply exfoliating and brightening enzyme peel. All Facials include a Complimentary Consultation with a Skin Care Professional. Customize your experience with one or more of these added services! Add any 2 essential oils to the treatment of your choice. Increase relaxation and reduce pain with our CBD-Infused massage oil. This special treat is a perfect add to any service. Stimulating, nourishing, and relaxing! Share any combination of services with your loved one, side-by-side. Great for Mother/Daughter, Couples, and Friends! Shealynn Pittman is the Co-Owner/Operator of Pure Skin Organic Day Spa since the spring of 2019. Shealynn is a Licensed Esthetician with advanced training in Holistic Skin Care. She is also a Licensed Massage Therapist specializing in integrative massage modalities and prenatal massage services. Her passion is to provide an intimate and personal experience with Organic products and Holistic approaches, encouraging clients along their way to optimal health and wellness for their entire body. Ellen Powers is Co-Owner/Operator of Pure Skin Organic Day Spa alongside Shealynn. Ellen is a Licensed Massage Therapist specializing in intuitive and deep tissue massage modalities since 2013. She has a keen sense of locating dis-ease in the body, and is passionate about helping her clients find release from tension that is often the root cause of secondary conditions that may exist. Being an owner-operated business brings high standards into all aspects of Pure Skin Organic Day Spa. Our mission at Pure Skin Organic Day Spa is to inspire clients to nourish their skin with loving-care using the best natural products and self-care rituals. Please read all our 5 star reviews!